ZEBULON, N.C. - Minor League Baseball (MiLB) today revealed an expanded roster of 72 teams, including the Carolina Mudcats, set to participate in its "Copa de la Diversión," or "Fun Cup," a season-long event series in 2019. The Mudcats, along with the other participating teams will unveil new culturally-relevant "Copa de la Diversión" on-field brands in March 2019. Minor League Baseball's "Copa de la Diversión"
ST. PETERSBURG, Fla. - Minor League Baseball (MiLB) today revealed an expanded roster of 72 teams set to participate in its "Copa de la Diversión," or "Fun Cup," a season-long event series in 2019. The cornerstone of MiLB's U.S. Hispanic/Latino fan engagement initiative, "Copa de la Diversión" established an innovative new platform authentically connecting MiLB teams with their diverse communities, embracing the culture and values that resonate most with Hispanics/Latinos nationwide. From adopting culturally-relevant on-field personas - such as the Albuquerque Isotopes transforming into the "Mariachis de Nuevo México," and the San Antonio Missions celebrating sandal-wielding matriarchs as the "Flying Chanclas de San Antonio" - to integrating more local flavor into their gameday experiences, the 33 teams who dedicated 167 games as "Copa de la Diversión"-designated events reported a 12.6 percent attendance increase compared to similar game dates in 2017. Retail sales of "Copa"-specific licensed merchandise via MiLB ballparks' team stores and MiLB teams' online stores far exceeded participating teams' preseason goals, with current sales projected to be more than 500 percent higher than pre-campaign estimates. MiLB will report final "Copa de la Diversión" results at the Baseball Winter MeetingsTM in Las Vegas this December. "The initial 'Copa de la Diversión' results and overwhelmingly positive feedback suggest that our fans are embracing the passion and commitment our teams have poured into this transformative campaign," said Kurt Hunzeker, MiLB's Vice President of Marketing Strategy and Research. "We listened and learned from fans what we could do better next year, and those insights will help frame how our expanded 'Copa' teams plan, prepare and activate fan engagement and marketing efforts celebrating their communities in 2019." All 33 teams who participated in the inaugural 2018 campaign will return for the expanded 2019 edition. The new "Copa de la Diversión" teams will bring the total number of states represented to 29 and includes a diverse mix of market sizes and community demographics. The teams are: the Arkansas Travelers, Bradenton Marauders, Carolina Mudcats, Charleston RiverDogs, Chattanooga Lookouts, Clinton LumberKings, Columbia Fireflies, Columbus Clippers, Delmarva Shorebirds, Down East Wood Ducks, Erie SeaWolves, Florida Fire Frogs, Fresno Grizzlies, Greensboro Grasshoppers, Gwinnett Stripers, Hickory Crawdads, Iowa Cubs, Lake County Captains, Lakewood BlueClaws, Lancaster JetHawks, Lansing Lugnuts, Lexington Legends, Louisville Bats, Midland RockHounds, Modesto Nuts, Myrtle Beach Pelicans, Nashville Sounds, New Hampshire Fisher Cats, Norfolk Tides, Reading Fightin Phils, Reno Aces, Richmond Flying Squirrels, Salem Red Sox, Scranton/Wilkes-Barre RailRiders, Tacoma Rainiers, Trenton Thunder, Tri-City Dust Devils, West Michigan Whitecaps and Wisconsin Timber Rattlers. All new culturally-relevant "Copa de la Diversión" on-field brands will be unveiled in March 2019. 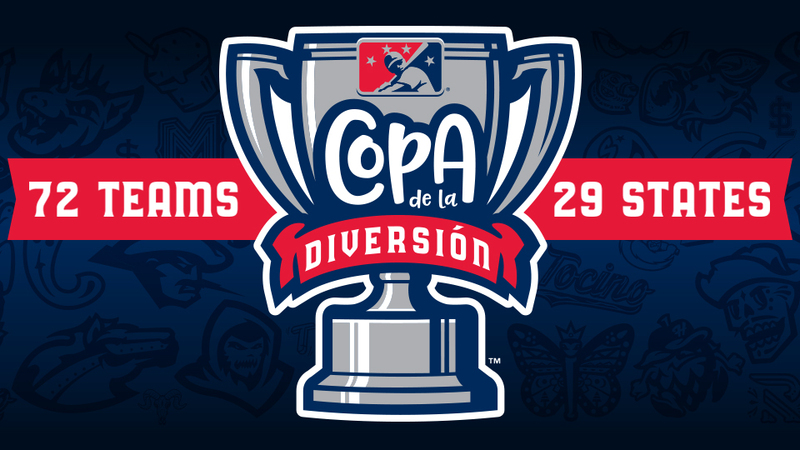 For more information on "Copa de la Diversión," visit MiLB.com/Copa.